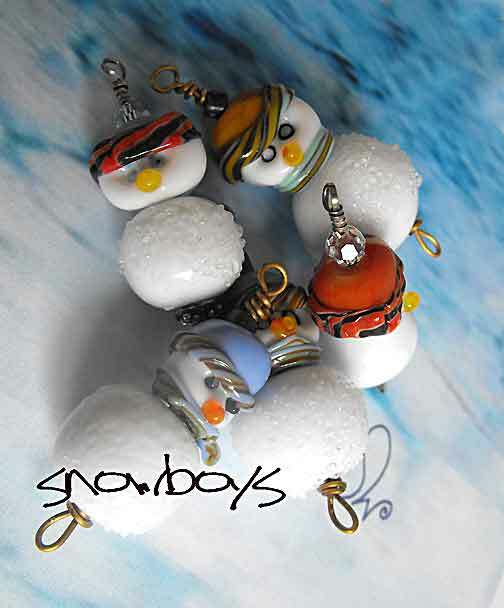 Too small to be a full grown snowman, these little guys are just the right size to dangle on your cell phone, your car mirror or simply add to a plethora of other charms and wear as a pendant. Each measure roughly 4.5-5 cm (including the brass or sterling wire) and are dressed in warm winter attire.. matching toque and scarf. These boys tend to sell fairly fast in real life so I don’t take photos of all. >so adorable! love love love the pale blue one.. really winter wonderland. is that price per lot? or indiv. piece? >per boy Tracie..:) & thanks! >the snow boys are totally mag, very cute! >just wondering how my little sno boy is coming along? >he's still in rod form wondering himself…I'm behind as usual Susan~ sent you a message on your blog! >Hi Deb, Thank you so much! I received my Canadian Snowboy today and he is PERFECT!! I know my daughter over in Australia will just love him, and I am sure he will remind her of home! You are currently reading >Canadian snowboys at fireandglass.